The U.S. sportswear make Nike has long been one of the world's leading sporting goods manufacturers and is known for its running gear . The big breakthrough for this popular brand came in 1984 thanks to the highly successful cooperation with the basketball star Michael Jordan, for which the label is known today. In the Nike clothes range the brand has made a name for itself by designing fashionable and functional Nike clothing for men, women and children. 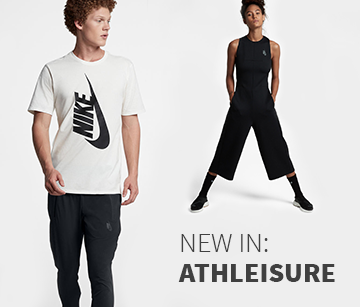 The Nike clothing selection in our online shop ranges from tank tops, T -shirts and long-sleeved T-shirts to hoodies, jackets and windbreakers, and even shorts and pants. We also have hats, socks, gloves and underwear, all included in the extensive range of Nike clothing. If you want matching running shoes to complete your Nike look, just check out our Nike running shoes section. Using our quick search or the filter you can find on the left side of the page, you will find the ideal Nike gear for you, quickly and easily. You can choose what materials you prefer and what properties your Nike running clothes should have. Of course you also have the opportunity to choose your favourite colour and specify the price range to suit your budget. Are you unsure about what things to pay attention to when buying running clothes online? Then turn to our running consultants. They are always available for you via our online chat and can offer you tailor-made advice about running clothes. Of course you can also call us! Once you know the essentials regarding the choice of running clothes, you can begin your search. In the Nike clothes department of our online shop you´re sure to find what you´re looking for, since all models are distinguished by their trendy design. For example, a cap from our Nike category is not just functional headgear, but a stylish beanie, and the running jackets look so fashionable that you can wear them in your spare time. The best thing about the Nike clothes is that you´re not just out to make a good impression - they also include many great features. There are many cool sport styles in the Nike clothes department, literally: clothes made of breathable, antiperspirant Dri-Fit materials that provide a fresh feeling while running. In addition, the Nike clothes models all fit perfectly to your body movements and have flat seams and elastic cuffs to make them extra comfortable. In addition, reflectors provide added visibility in low light conditions to significantly improve your personal safety, especially important during the dark winter months. In addition, Nike clothes offer all kinds of practical inner compartments and zipped pockets in which you can securely store items such as keys, mobile phones or media players. To top it off, all Nike clothing is machine washable and retains its shape even after many washes. Enjoy the best of the best for even longer! Would you like to start right away with your new Nike clothes? Then order your favourite gear before 16.00 o'clock because we will ship your new running outfit on the same day! Fast dispatch and swift delivery at a great price, it doesn´t get any better.